Despite regularly selling out arenas and stadiums around the world, t he star is to perform at the BBC's Maida Vale studios next month in front of the tiny gathering. Sir Paul's performance on October 16 will be broadcast to listeners of Radio 6 Music as part of a week-long season of live shows by leading acts. Others in the 6 Music Live at Maida Vale shows include Goldfrapp, Manic Street Preachers and Sigur Ros. It is thought to be the first time Sir Paul has played at the BBC's Maida Vale since the early 1960s with The Beatles. The audience for this new show will be smaller than the 300 who packed into London's 100 Club for a performance in December 2010. 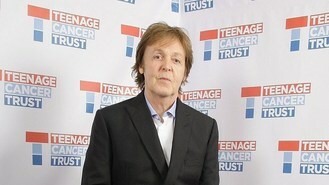 Sir Paul's gig will feature in the morning show of presenter Lauren Laverne. Jeff Smith, head of music for the digital station, said: "6 Music Live at Maida Vale has come of age in 2013. "And to have such a diverse line-up including the world's most loved singer songwriter is a dream come true, especially for the lucky listeners who will also be able to watch Paul McCartney perform live."